1. Neogeography: I got this term from Elijah Meeks, who has worked on projects like Orbis, Authorial London, Kindred Britain, and others. In his keynote, he described how sophisticated interactive maps can help in both visualizing and understanding historical events. Orbis, for example, allows users to map a voyage across the Roman Empire, taking into account weather, costs, forms of transportation, and other factors. Another example gives viewers an interactive experience in Middle Earth (compare to this version), or of the imagined future in Infinite Jest. 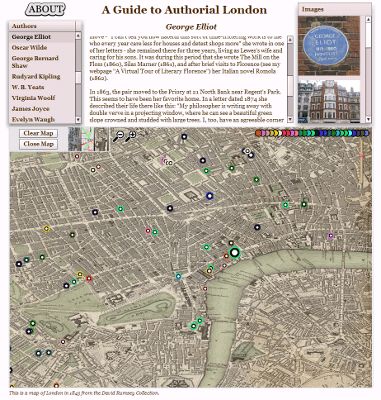 George Eliot’s locations in London, from the Authorial London project. Interested in doing this kind of work? Check out the Neatline tool, which facilitates map production using the Omeka interface. I’d love to see a map of Los detectives salvajes. Sense and Sensibility (film) and thematically related texts, as understood by TVTropes. Networks make exciting visuals, but they also have great analytic capability, which other people have described better than I can. 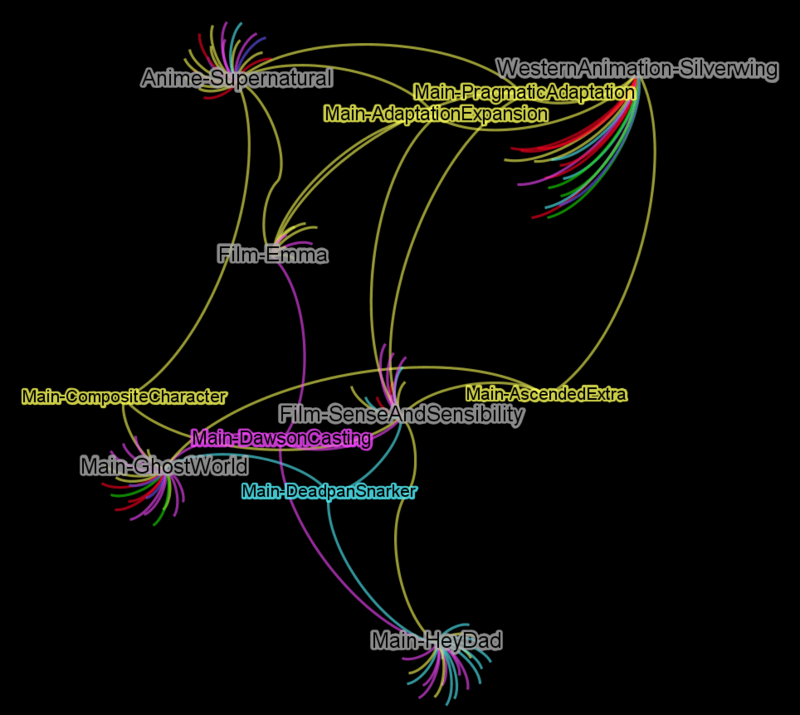 If you’re interested in building one of these yourself, check out the not-as-difficult-as-it-used-to-be tool Gephi, available as a free download. You might also check out Bookworm, which lets you track words over time in large online corpora – kind of a more scholarly version of the Google NGram viewer. I like many of these projects because they are not exclusively scholarly – they create new modes of engagement for readers and researchers alike. I also like them because I can see their application for my own work. Maybe you can too.